Mouth-To-Lung Vs. Lung Hits And What’s The Difference? Happy Monday everyone, I hope your week started off great. Now here’s a scenario I came across just recently. A good friend of mine recently purchased a sub-ohm tank and was having a hard time using it. She felt funny vaping from the tank she just bought mainly because of the airflow adjustment. The draws were too airy for her. She wondered if she had made a mistake in buying this type of tank. “You’re just hitting it wrong,” I said. So I came up with an idea for my next blog post based on the conversation I had with her. I will do my best in explaining the the two ways vapers usually inhale in the simplest way I can. As a former smoker, this is the type of vaping I started off with. The mouth to lung hit is when you draw in the vapor to your mouth, then inhale then exhale, like you would with a cigarette. Hmm, the best way I can describe this is comparing it to smoking a marijuana joint. You draw the vapor directly to your lungs, and exhale. This style of vaping took me some time to get used to, but this is the way I vape now. The Differences between the two and which is better? Let’s start with flavor. I have to give this one to mouth to lung. Sure, you can taste juice with lung hits, but the mouth to lung lets you “savor” the flavor as it lands on your taste buds. As for lung hits, you taste the flavor more on the exhale. 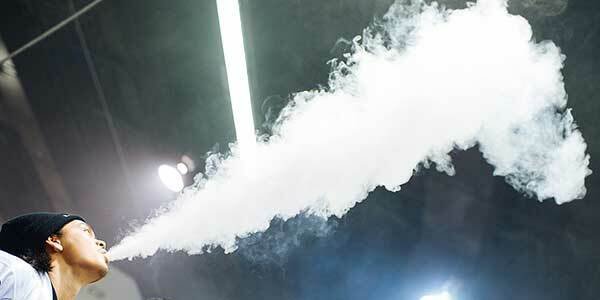 When it comes to vapor production, it would go to lung hits hands down. You can try it yourself, notice more vapor when you draw it in directly to your lungs? If you aren’t used to lung hits, you most probably will be coughing while trying to attempt this. If you are trying to increase vapor production, master this vape technique and you will become a cloud chasing master. Also, try lowering your nicotine level because it smacks you harder when you vape this way. Also, with the new sub-ohm tanks coming out, they were specifically made for these lung hits. Other features like wide bore drip tips help draw in more vapor to your lungs. My advice to my friend since she wasn’t used to lung hitting was to adjust the airflow to the smallest setting and do her normal mouth to lung hits. She’s getting better at it, I’m just glad she is now appreciating her new sub-ohm tank because they really are great to have as a vaper. Of course, there is no correct way to vape. This all depends solely on your preference. Remember, mouth to lung for flavor, lung hits for vapor! Great read, many do not know the difference and it does make a big difference. My wife was willing to give up vaping because of all the coughing, but I encouraged her and told her the exact thing…take the mouth to lung hits with smaller airflow and nit has helped. Hey thanks Robb! Yeah, its a hurdle a lot of ex smokers get caught up in when they transition to vaping. I’m glad it helped her out.